Available for performances, shows and instructional workshops. Bellydance Instructional Classes in Hollywood, California (Los Angeles Area). We have an ultra modern performance of the ancient art of Belly Dance, the modern Brazilian Samba Dance (Escola de Samba Style), the optimistic Hula/Polynesian Dance and Indian Bollywood Style. Our dance group is proficient in ballet, jazz, flamenco, modern, contemporary dance, African, tribal, Polynesian, Hula, Latin, belly dance, hip hop, burlesque and Brazilian Samba styles. We can customize the show to fit your needs and make special choreographies for your special request songs. Props such as fire poi, cymbals, drums, candles, swords, cane and veil dance are also available. Our show is a delightful trip into the exotic and whimsical world of dance as an expression of art. 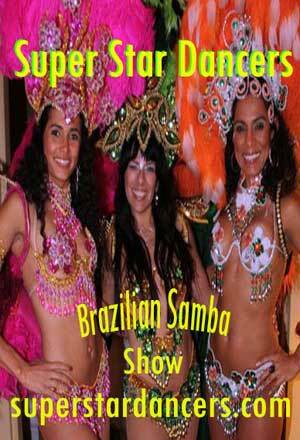 The Samba dance Super Star and Super Star Belly Dancer Groups are professional international dancers with classic formation and international style specialized mainly in Brazilian Samba and Belly dance (Raks Sharki ). Their elegant Raks Sharki includes both classical Egyptian and Lebanese cabaret influences as wells contemporary and modern with Latin and Brazilian influence. Specialties include zills (finger cymbals or zagats), cane dancing (Raks Al Assaya), and sword dancing (Raks Al Sayf). Super Star Belly Dancers are beautiful with mesmerizing performances loved by audiences of all ages all over the world. Adasha is also available for private lessons and workshops.